The remains of one tower of the fort were found during digging for the Paris Métro (rail mass-transit system) in 1899. These were moved to a park, the Square Henri-Galli, a few hundred meters away. The outline of the fort is also marked on the streets and sidewalks with special paving stones. 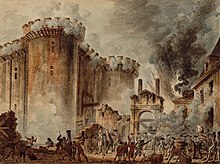 A cafe and some other businesses are now on the site of the fort, and the rue Saint Antoine passes directly over it as it opens onto the roundabout of the Bastille. Lorentz, Phillipe; Dany Sandron (2006). Atlas de Paris au Moyen Âge. Paris: Parigramme. pp. 238 pp. ISBN 2840964023. This page was last changed on 11 January 2019, at 01:43.